An invaluable tool for glass cutting. 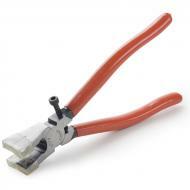 Running pliers act like a fulcrum to open score lines using even pressure. Adjustable screw accommodates different glass thicknesses.